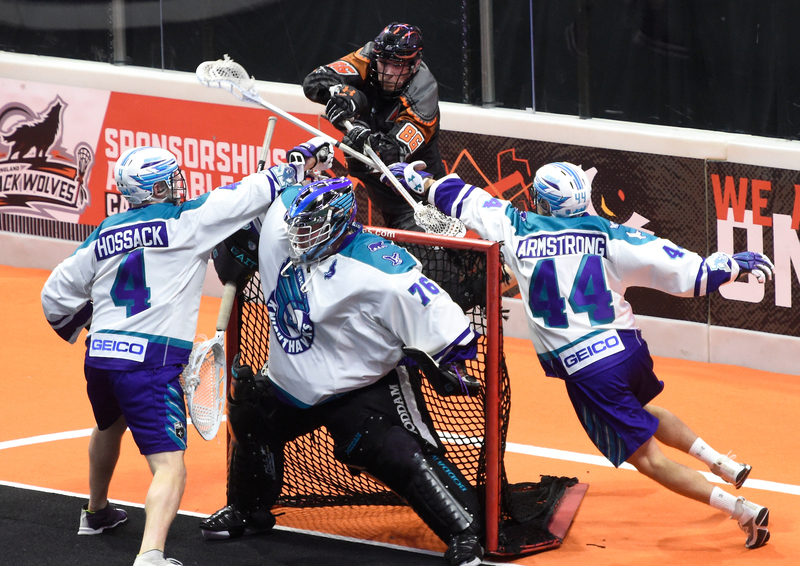 New England came into Sunday afternoon’s game looking to punch their ticket to the NLL postseason, but instead it was the Rochester Knighthawks who ended an eight-game losing streak, defeating the Black Wolves 13-8. Warren Hill picked up his first career win and was superb for Rochester, stopping 50 of 58 shots and keeping the Knighthawks’ slim playoff hopes alive. Unfortunately, instead of the focus being on the game, Callum Crawford set social media abuzz – again – with a hit halfway through the fourth quarter. After losing his stick, Crawford delivered a high hit to Jake Withers that sent him sprawling to the turf. The recently-maligned Crawford was assessed a five-minute roughing major on the play. In slow-motion, it appeared that Crawford’s initial contact started on Withers’ chest and finished in the head area. For Crawford, the hit comes on the heels of serving a controversial two-game suspension for hits to the head of Toronto’s Bradley Kri and Calgary’s Tyler Pace. The game itself took a while to really get rolling. With only one first quarter goal and both teams benefiting from solid defense and good goaltending, it was the transition game generating the best scoring chances. It took until the 10-minute mark of the second quarter before the offenses really broke out of their funk as both teams combined to score seven goals. However, it was Rochester that capitalized with a three-goal run taking a 6-4 lead into halftime. The Black Wolves struck quickly in the third with a pair of transition goals from Nick Chaykowsky and Joel Coyle, tying the game at 6-6. Despite their recent record, the visiting Knighthawks looked relaxed and focused and were able to exit the third with a 9-7 lead. An early power play marker from Reilly O’Connor drew New England within one goal, but that’s as close as they would come. Backed by the timely goaltending of Hill, Rochester went on a four-goal run to seal the victory and end their dreadful losing streak. A spirited fight between Dawson Theede and Andrew Suitor late in the fourth concluded the afternoon. Mike Burke led Rochester with two goals and three assists. For the second game in a row, Kyle Jackson netted a hat trick and added an assist for a four-point game. Veteran Cody Jamieson finished with two goals and two assists. New England’s offense ran up against a hot goaltender in Warren Hill. Reilly O’Conner managed two goals and an assist, while Callum Crawford had a goal and two helpers in his return. Goaltender Doug Jamieson stopped 44 of 57 shots in the loss. The scoreboard wasn’t the only dominating the Knighthawks did this game. They won 18 of 25 faceoffs and also scooped up more loose balls than New England. New England did manage to go 2/5 on their power plays—at 40% they managed to do slightly better than the Knighthawks who pulled in 37.5%. The game was quite physical with 18 penalties called including Crawford’s major. Aggressive play has become somewhat synonymous with New England this season and one has to wonder if this is impacting the team’s play as a whole as they failed to clinch a playoff spot for at least another week. The Black Wolves will get another shot at clinching a playoff berth next week when they take on the Western Division leading San Diego Seals (9-4), while Rochester returns home to the Blue Cross Arena for a date with the Toronto Rock (9-5).